Hawick’s Lisa Thomson has been signed by top female French club Lille Metropole Rugby Club Villeneuvois (LMRCV). The partnership between Scottish Rugby and LMRCV will see Thomson and Scotland team-mate Chloe Rollie play in the French Top 8 this season alongside internationalcolleague Jade Konkel, who moved to the club earlier this month. The contracts are for one year initially. Thomson and Rollie will become full-time Stage 3 players in the BT Sport Scottish Rugby Academy and will be available for Scotland Women selection, making them the country’s newest professional female players. Villeneuve d’Ascq, based in northern France near Lille, were crowned Top 8 champions in 2016 and were runners up in the 2017 final against Montpellier. Thomson, 19, has earned 12 Scotland Women caps since her debut in the 2016 Six Nations and captained Scotland Women 7s to win the 2017 Rugby Europe Women’s Sevens Trophy. 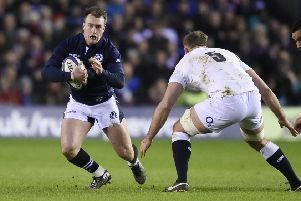 The Edinburgh University centre, who grew up in Hawick and played for Murrayfield Wanderers and Melrose, said: “Becoming a full-time rugby player is something I’ve always wanted. It came around a bit quicker than expected. It’s good for the women’s game as it gives the young ones something to aspire to. “Playing in the Top 8 is going to be a good test. It’ll be a consistently high standard week-in-week-out and we’ll have a lot more rugby-based training over there with team and gym sessions every day.